Vivo 60 is a life-support ventilator intended for paediatric patients and adults requiring highly secure and reliable ventilation in the hospital or at home. 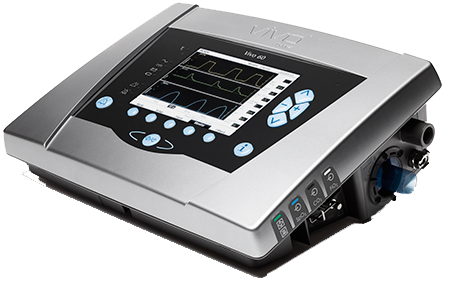 Vivo 60 offers clinical excellence, versatility and a low cost of ownership. Vivo 60 is a life-support ventilator intended for paediatric (>5 kg) and adult patients requiring highly secure and comfortable ventilation in the hospital or at home. 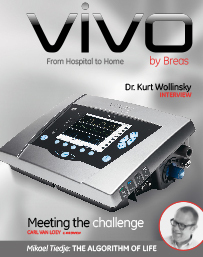 Vivo 60 offers Clinical Excellence, Versatility and a Low Cost of Ownership, in the hospital and at home. To treat patients under some of the most challenging circumstances, caregivers require security and clinical excellence. Vivo 60 is developed to meet these demands and offers the following benefits. Intended use for paediatric (>5 kg) and adult ventilator-dependent patients. Multiple pressure and volume modes including target volume and SIMV (to find out more about SIMV). Excellent patient-ventilator synchronization thanks to its responsive trigger technology combined with highly accurate volume delivery. Dedicated features for paediatric use, e.g. tidal volumes down to 50 ml and a controlled breath rate up to 60 bpm. Versatility is a requirement equally important to patients, care givers and home care providers. Vivo* 60 provides multiple benefits to make it a truly versatile ventilator. Demands for cost-effective treatment and service are continuously increasing. Vivo 60 has been developed to offer an attractive cost of ownership to hospitals and homecare providers. Its design, shared with Vivo 50, has proven to be highly robust. Accessories like the protective cover add to durability in mobile use. Cost-efficient service has been made possible by a modular design of Vivo 60. Parts can be quickly and easily replaced. Synergies with Vivo 50 can be achieved regarding technical training and spare part management. Integrated monitoring capabilities reduce the need for costly additional monitoring equipment. The intuitive user interface with its simple menu structure and direct access buttons help reduce the time needed for training and getting to know Vivo 60. The Vivo 60 also brings advanced monitoring capabilities providing detailed insight in the quality of ventilation. Intended use: for paediatric (from 5 kg) and adult ventilator- dependent patients. High Pressure, Low Pressure, High PEEP, Low PEEP, High Vte/Vti , Low Vte/Vti , High MVe/MVi, Low MVe/MVi, High Breath Rate, Low Breath Rate, Apnea, Disconnection, Rebreathing, High FiO2, Low FiO2, High SpO2, Low SpO2, High EtCO2, Low EtCO2, High InspCO2, High Pulse Rate, Low Pulse Rate, Low Last Power Source.